This is the perfect starter to a dinner party. With the holidays upon us we all need ideas on what to serve to keep our guests satisfied until dinner. 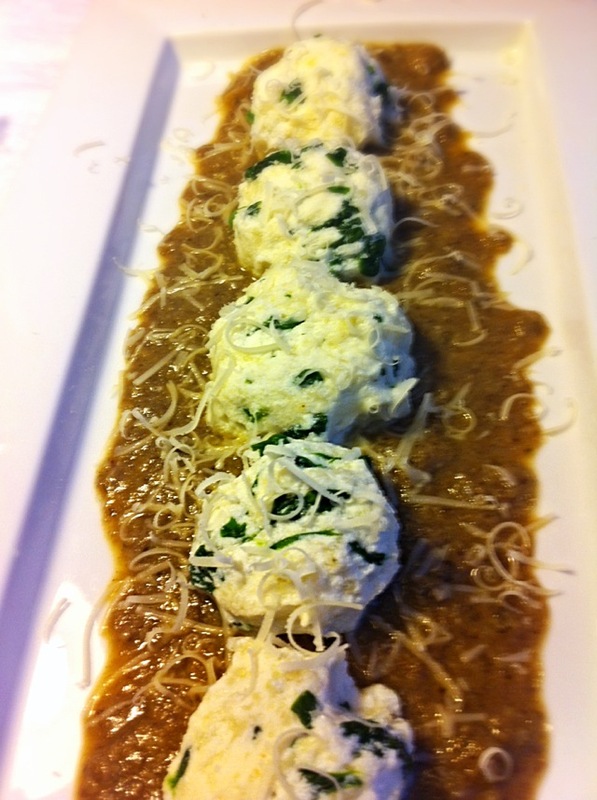 Gnudi is perfect with a great tomato sauce or with this recipe where I made an earthy mushroom sauce. You may also enjoy this as your main course with a salad and bread. Totally up to you on how you want to play with it. Gnudi is like the inside of a ravioli (creamy, light and full of cheesy flavor.) Enjoy with a nice glass of Cabernet. In a medium bowl mix together; Ricotta, egg, spinach, panko, salt, pepper, flour and nutmeg. Don’t over mix. Then begin to form small golf size balls (you can make them bigger or smaller). Take 4 to 6 balls at a time and place them in boiling salted water. When they start to float to the top about 2 to 3 minutes. Take them out and place them in ice cold water for a couple seconds. Take them out and place to the side and drizzle some olive oil on them until ready to serve. In a medium sauce pan add some olive oil and butter on medium heat. Add shallots cook for about a minute. Then add garlic and mushrooms. Cook for about 3 minutes or so until mushrooms start to sweat out the juices. Then pour the stock and cook for another 4 to 5 minutes then take that and put into a food processor and pulse. Pour sauce into a plate and add the gnudi. Top with some fresh parmesan cheese. Are the gnudi at room temperature when you serve them? They look yummy. These look yummy! Are the gnudi themselves served at room temperature?